As It turned out, I ended up cutting the joinery in 20 peeled hemlock logs up to 24' long and 24" in diameter. Far to many to be messing around snapping lines, "hovering" stuff and hoping it all worked out in the end. What I needed was a giant jig to make this a reasonably fast and more importantly - precise process. More research lead me to Jeff Arvins article "Round post, square beam joinery" in the September 1996 issue of Timber Framing and also reprinted in the Guilds publication "Timber Frame Joinery and design" Vol. 2. Squinting at Jeffs photos in the article lead me to build a set of rails 34' long and about 26" wide using a pair of 2x12 LVLs. Suffice it to say that these rails were laboriously straightened, plumbed, leveled and sworn at daily. The peeled log post to be was cut about a foot longer then finished length and 8" plywood squares were screwed onto each end using a level. The post was then centered on a cross piece between the rails so that it was supported on each end by the plywood squares - These squares now accurately identify the four sides of the post and the center. I made a series of jigs out of birch plywood that slide on the LVL rails. This one is for using 10" and 16" saws to crosscut the timber. With this first cut at the base of the post I'm establishing the finished bottom - the point where all measurements start. As I rotate the post to cut joinery on all the sides, I always lined up with a square and made this cut first. With all the joinery cut and the post moved on to saw horses I could finish cutting through the log with a handsaw and have a nice square base. On this project all the connecting timbers were 6x8s and the braces were 3x6s - So I built birch plywood jigs to center and rout the housings for these members. Basically I'm routing windows into the log. I used two routers with mid size and long top mounted bearing bits to make the housings. As the plywood jig holes elongated with use - I glued in strips of metal strapping to return them to size and prevent further erosion of the template. Moving the plywood jigs to either end of the log and measuring down to the center of the 8" plywood square gives the height of the jig above the post center. Measure down from the top of the jig to the housing and subtract from the height and you have the distance of the housing from the center of the post. Center to center post dimension minus your housing to center offsets on each end equals your shoulder to shoulder connector length. I then screwed a simple plywood template on to the new flat spots and the Mafell made quick work of the mortises. A little clean up with a chisel and it's time to roll the post 90 degrees and repeat the process. This is a view of the top end of the post - I've used another plywood jig to rout flat spots to define a shoulder. I'll finish cutting a tenon here with the 8" square removed and the post on sawhorses. Great Stuff. Great site. And my favorite power tools too. This is the exact set up with saws and mortises I'm striving to. You mentioned laboriously having to fiddle with your ingenious set-up. Any thoughts on building it differently after the fact? How much time did you have on the front end to build these? One other question for you besides all the goodness above. Why did you reference the bottom of your posts? I disagree with making the bottom cuts first. I prefer to always reference the highest shoulder and leave the posts long, shoot with a transit, then adjust post bottoms last. I guess your subframing was probably done by you, and judging from your precision, it was OK to go ahead with the cuts on the bottom. Thanks for the post. Lot of stuff to digest here. I agree with you about using the bottoms of the posts as a reference when working with an unknown foundation. However as you surmised, I cut the basement timber frame that these posts stand on - so knew it was level. I spent a couple days building the rail system and went through several generations of box jigs that slide on the rails. One of the things we seriously underestimated was how much more work it is to handle peeled logs vs. square timbers. Picking them up, moving and setting them down with a forklift all without having them roll off somewhere and get dinged or crush somebody was an issue. The rails were set up under a low shed roof with forklift access from only one side - Next time I'd set this up in the middle of a large parking lot with good access from all sides and really think through the work flow to minimize handling. Great post and pictures. 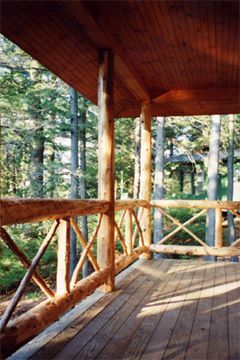 I made a much smaller version of this when doing a custom log peeled railing system. Posts 6-10" in diameter and only 8' long, with crossing timbers in the 6" diameter and less range. Built a plywood table with saddles to hold the posts or rails, then built a sled that my router would ride on. I drilled and chopped the mortises... didn't bother messing with a jig to get my Makita mortiser on there, but that would have been a good option for a production setup. I semi scribed the round into the round - so my router template was a 4" diameter circle. I adjusted my router depth, routed out the circle and created the mortise. When I had the mate cut I would then insert the tenon and scribe the balance of the diameter by hand. Can't find any photos of my table... lost them on an old PC. Here's a tiny shot of the rail installed. Mike, you said you supported the 24' log on the ends.... did you have much sag in the middle? Did you have to shim it, in the middle to keep them straight? Hi Jim -- I didn't support the middle at all. Basically the longer the posts, the larger in diameter they were - I kept an eye out for deflection or sag, but didn't see any worth doing something about. The winter cut hemlock we used was quite stiff. My guess would be pine might have needed some extra blocking. Hey Al, I can relate but there is a lot of coming and going on the internet and web services can just vanish. If this topic is important to you, follow the crumbs by sending a message to the poster or follow the link to the posters website. Good luck with your pursuits.